Our vision: We are committed to providing more efficient and safer garden management tools for the rest of the world, helping people reducing the tiredness of spraying and cleaning of their garden. Warranty: This product is guaranteed against defects for a period of 12 months from date of purchase. Our goods come with guarantees that cannot be excluded under the American Consumer Law. You are entitled to a replacement or refund for a major failure and for compensation for any other reasonably foreseeable loss or damage. 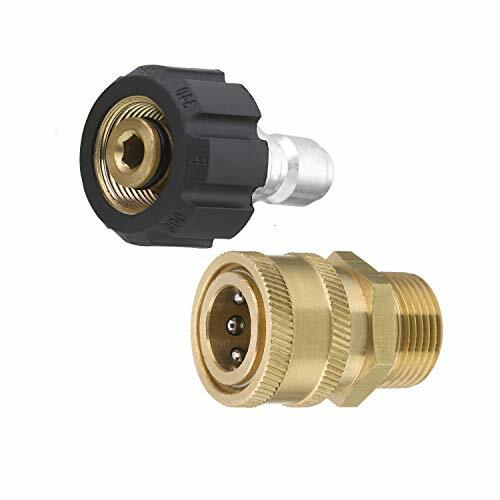 Item: Tool Daily Pressure Washer Adapter Set, Quick Connect Kit, M22 15mm Swivel to M22 15mm Male Fitting. Feathers: M22 15mm swivel + 3/8¡± plug, 3/8¡± quick disconnect + M22 15mm male. Convert the M22 thread-on couplings to a 3/8 inch quick connector. Apply on universal gun, hose and pump connection. Easy to connect and disconnect. Working Pressure is up to 5,000 PSI. Tool Daily sells 15mm fitting, not 14mm. If your fitting is 14mm, it may cause leakage. It fits Sun Joe. Notes: Tool Daily sells 15mm fitting, not 14mm. If your fitting is 14mm, leakage might be caused. ATTENTION: INSIDE DIAMETER IS 15mm, NOT 14mm. If your fitting is 14mm, it may cause leakage. It fits Sun Joe. M22 15mm swivel + 3/8" plug, 3/8" quick disconnect + M22 15mm male. Convert the M22 thread-on couplings to a 3/8 inch quick connector. Apply on universal gun, hose and pump connection. Easy to connect and disconnect. Working Pressure is up to 5,000 PSI. SATISFACTION GUARANTEED: Our team of professionals is constantly working to make you more efficient and safer to clean. We are confident in the quality of our product and give you 2 YEARS WARRANTY and quick reply within 10 hours. Click "BUY IT NOW" and ENJOY QUALITY OF TOOL DAILY.